Lindblad Expeditions' National Geographic Quest, the line's first new build in the history of the company, commenced her inaugural voyage yesterday as she set sail from Juneau. 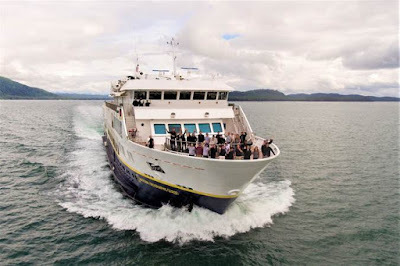 The most state-of-the-art expedition ship designed and purpose-built in the US, she departed with very excited guests for an 8-day expedition exploring Southeast Alaska. Sven Lindblad, CEO and President of Lindblad Expeditions, commended the team on the achievement, "You all must feel a deep sense of pride and accomplishment, you have all worked tirelessly to make this possible, and are a part of history having played an important role in the building and launch of the most sophisticated and beautiful ship built in the US in decades." The 100-guest National Geographic Quest will operate on the popular "Exploring Alaska's Coastal Wilderness" expedition through August 26, and will finish off the Alaska season with a "Treasures of the Inside Passage: Alaska and British Columbia" departure on September 2, 2017. The ship will then remain in the Pacific Northwest for a series of new voyages between Seattle and Vancouver, with stops in the San Juan Islands, Victoria, Alert Bay, and more far reaching stops in British Columbia's channels and fjords. Beginning in December 2017, she will reposition and operate expeditions in Costa Rica and Panama before kicking off a series of new voyages in Belize and Guatemala starting in February, 2018.